Dane flew into Tianjin and after several nights exployering the old port city, the little traveller took the 90 mile 24 minute bullet train ride to the south Beijing station. 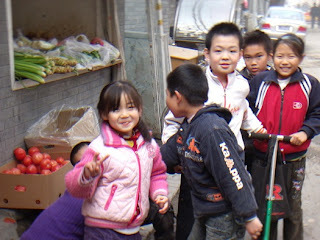 Ancient Peking in the hutong region is as charming as Beijing is amazing. The sights are fantastic, and the public transportation representative of Chinese culture, a perfect mix of the old and new. The big news was that Dane's oldest brother Josh, would join us in the Chinese capital!! You can't ever see it all but we tried to hit as many of the sites as possible in one vacation. And Dane grew more energetic by the day. The way China moves people is an example to the rest of the world. The bullet train and the spider web of monorails and speed trains leeping Beijing connected must be witnessed to believe. Only a decade ago it was a polluted traffic nightmare and today the organization and travel options are truly remarkable. China has set the bar for the entire world in this city!! China; officially the People's Republic of China (PRC), is the most populous state in the world, with over 1.3 billion citizens. Located in East Asia, the country covers approximately 9.6 million square kilometres (3.7 million square miles). It is the world's second-largest country by land area, and the third- or fourth-largest in total area, depending on the definition of total area. The People's Republic of China is a single-party state governed by the Communist Party of China (CPC). 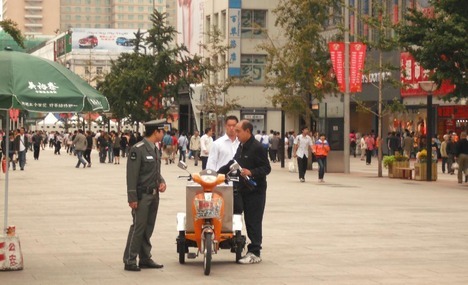 The PRC exercises jurisdiction over 22 provinces, five autonomous regions, four directly-controlled municipalities (Beijing, Tianjin, Shanghai, and Chongqing), and two mostly self-governing special administrative regions (SARs), Hong Kong and Macau. Its capital city is Beijing. The PRC also claims as a 23rd province the island of Taiwan, which is controlled by the Government of the Republic of China (ROC). This claim of Taiwan is controversial and related to the complex political status of Taiwan and the unresolved Chinese Civil War. China’s landscape is vast and diverse, with forest steppes and the Gobi and Taklamakan deserts occupying the arid north and northwest near Mongolia and Central Asia, and subtropical forests being prevalent in the wetter Southeast. The terrain of western China is rugged and elevated, with the towering Himalaya, Karakorum, Pamir and Tian Shan mountain separating China from South and Central Asia. The world’s apex, Mt. Everest (8,848 m), and second-highest point, K2 (8,611 m), lie on China's borders, respectively, with Nepal and Pakistan. The country’s lowest and the world’s third-lowest point, Lake Ayding (-154 m), is located in the Turpan Depression. The Yangtze and Yellow Rivers, the third- and sixth-longest in the world, flow from the desolate Tibetan Plateau to the densely-populated eastern seaboard. China’s coastline along the Pacific Ocean is 14,500 kilometres (9,000 mi) long (the 11th-longest in the world), and is bounded by the Bohai, Yellow, East and South China Seas. The ancient Chinese civilization—one of the world's earliest—flourished in the fertile basin of the Yellow River in the North China Plain. China's political system was based on hereditary monarchies, known as dynasties, beginning with the Xia (approx. 2000 BC) and lasting almost 4,000 years, until the end of the Qing Dynasty in 1912. Since the Qin Dynasty (not to be confused with Qing Dynasty) first united China in 221 BC, the country has been divided and reunited numerous times in history. The Republic of China (ROC), founded in 1912 after the overthrow of the Qing, ruled the Chinese mainland until 1949. Taiwan with its capital in Taipei. The ROC's jurisdiction is now limited to Taiwan, Penghu, Kinmen, Matsu and several outlying islands. Since then, the People's Republic of China and the Republic of China (subsequently became known as "Taiwan") have remained in dispute over the sovereignty of China and the political status of Taiwan, mutually claiming each other's territory and competing for international diplomatic recognition. In 1971, the PRC gained admission to United Nations and took the Chinese seat as a permanent member of the U.N. Security Council. The PRC is also a member of numerous formal and informal multilateral organizations, including the WTO, APEC, BRIC, the Shanghai Cooperation Organisation and the G-20. As of September 2011, all but 23 countries have recognized the PRC as the sole legitimate government of China. Since the introduction of market-based economic reforms in 1978, China has become the world's fastest-growing major economy, and the world's largest exporter and second-largest importer of goods. it is the world's second-largest economy, after the United States, by both nominal GDP and purchasing power parity (PPP). On per capita terms, however, China ranked only 90th by nominal GDP and 91st by GDP (PPP) in 2011, according to the IMF. China is a recognized nuclear weapons state and has the world's largest standing army, with the second-largest defense budget. In 2003, China became the third nation in the world, after the Soviet Union and the United States, to independently launch a successful manned space mission. China has been characterized as a potential superpower by a number of academics, military analysts, and public policy and economics analysts. China is the 3rd or 4th largest country in the world by total area and the second largest by land area. It stretches about 5,000 km (3,107 mi) from east to west, and about 5,500 km (3,418 mi) from north to south. Its land borders 14 countries. There are some 4,345 km (2,700 mi) of coastline along the China Seas. [disambiguation needed] China is divided into twenty-three provinces, five autonomous regions, four municipalities and two special administrative regions. The autonomous regions have traditionally been referred to as "Outer China" because they are located beyond the Great Wall of China. China is bordered in the north, west and south by deserts, and high mountains form natural barriers. The North China Plain in eastern China is the largest area of lowland in the world. Tibet, which is in the west, is a plateau, or tableland, more than 4,000 meters (13,123 ft) high and surrounded by the highest mountains in the world. It is known as the "rooftop of the world". To the south are the Himalayas, while to the northwest are the Kunlun, Tian Shan and Altai mountains. Eastern China alo has mountains and hills, but much more level land than western China. Eastern China is divided north-south into two very different geographical areas. The boundary between the two is formed by the Qinling Mountains which stretch from east to west and separate the basins of the Yellow and Yangtze rivers. These mountains also form a major climatic divide. Four rivers and their tributaries provide China with its main plains. In the northeast the north-flowing Songhua and south flowing Liao rivers form a lowland, which is surrounded by mountains. The Yellow River and the Yangtze River (the 3rd longest in the world), both flowing out of Tibet, have built up a wide plain stretching from Tianjin south to Shanghai. 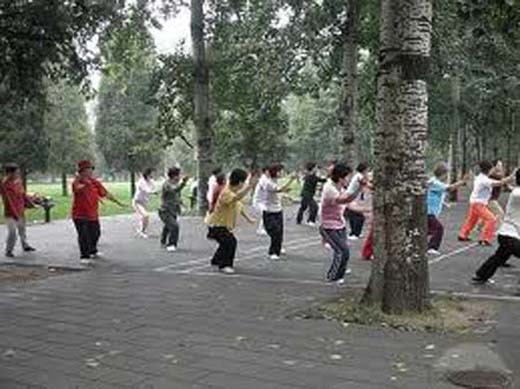 Northern China has wet summers and dry winters. On the northern plain it is colder in winter than anywhere else in the world at the same latitude, and for at least a month the temperature is constantly below freezing. Further south it is warmer and in the valley of the Yangtze River the winter is milder with a little rain. In the far south conditions are hot all year round. June to September are the wettest months when the summer monsoon blowing in from the south and southeast brings much rain. Dane loved that cable car and still talks about it although I thought it was smooth for an enjoyable five minutes. Those 750 meters of eight inch boards 150 feet high in the Borneo rainforest was more concerning to Dad, but listening to Mom scream crossing every pole made it worth the admission. Only slightly farther from downtown Beijing than Badaling, the Great Wall at Mutianyu is more spectacular and, despite the occasional annoyances of souvenir stands, significantly less crowded. 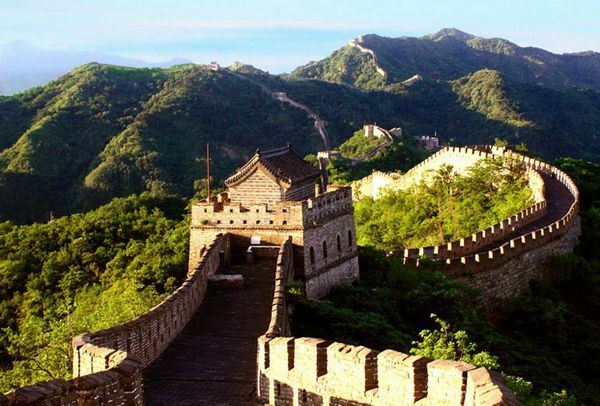 This long section of wall, first built during the Northern Qi Dynasty (6th century) and restored and rebuilt throughout history, can offer a solitary Great Wall experience, with unforgettable views of towers winding across mountains and woodlands. On a clear day, you'll swear you can see the deserts of Mongolia in the distance. The lowest point on the wall is a strenuous one-hour climb above the parking lot. As an alternative, you can take a cable car on a breathtaking ride to the highest restored section, from which several hiking trails descend. It is difficult for visitors to imagine how such a wall could have been erected in such a mountain ridge location, it is breath taking and awesome. Joshua Dane Hodges, not to be confused with his youngest brother, scaled to the highest peak at Mutianyu, and if you haven't been there, it looks a bit like steps running as high as a couple Chrysler buildings. Even the athletic 28 year old was visably winded after that deed. 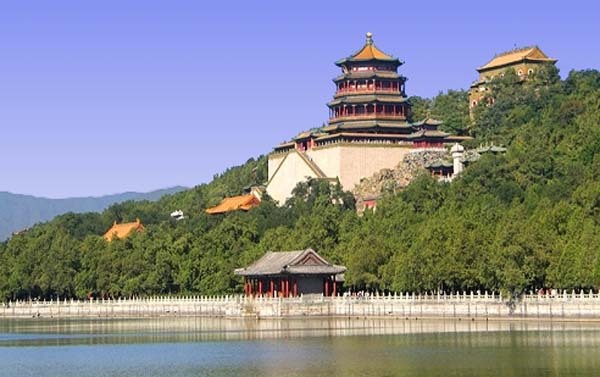 To many, many people, Beijing is the ancient capital city of the east and Forbidden City is the right place for you to start your Beijing tour by unveiling its mysterious face. Consisting of over 9,000 rooms and spread over 250 acres, this large palace complex was built between 1406 and 1420, but was burnt down, rebuilt, sacked and renovated countless times, so most of the architecture you can see today dates from the 18th century and on wards during the Qing Dynasty. Wear comfortable shoes as you have to walk a lot! 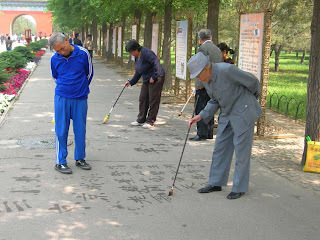 It may be helpful to have a guide explain the stories behind the site and tell you about the important historical parts in the forbidden city. Or if you are non-group tourists, I suggest you rent multi lingual guide recorder either at Meridian Gate ( southern gate of Forbidden city ) or the Gate of Divine Prowess (Northern gate of Forbidden City) and return it when you finish your tour of Forbidden City. 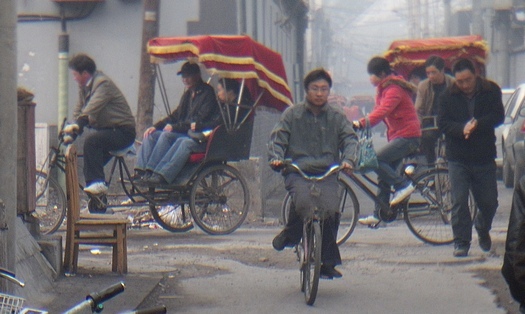 The way China moves people is remarkable. 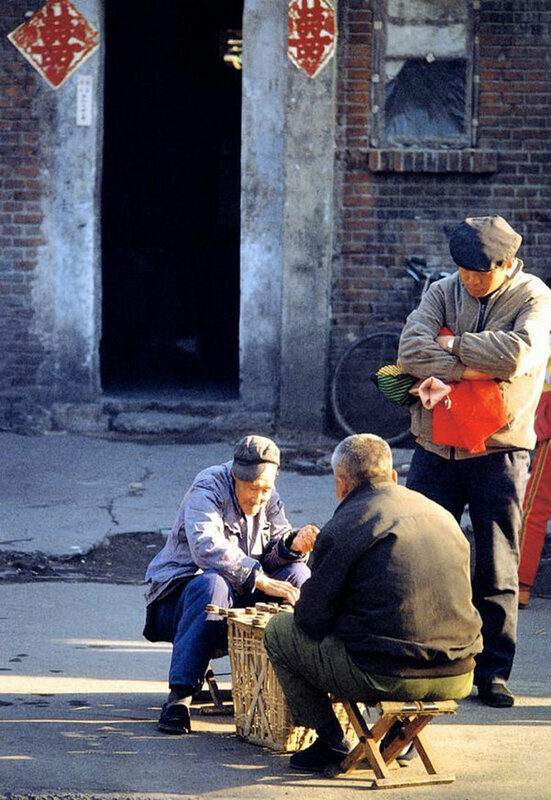 One must witness the way residents of Beijing move quickly and cost effectively to believe it. One can enter a high speed monorail or train from anywhere in the city and ride stylishly, swiftly, and confortably. Even the taxis are about 10 RMB (1.66 US) to any station. The bullet train was so smooth and fast that it was the most remarkable piece of transportation we have ever rode. Imagine 90 miles in 24 minutes while sipping tea! 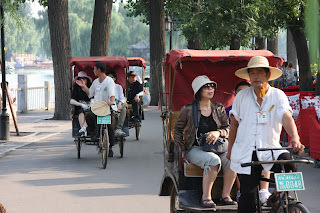 Do you have the experience of taking a pedicab? 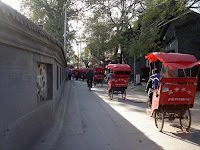 In the old Beijing hutong areas, you can find the ancient transportation tools now still preserved for tourists as the main traffic tool of visiting hutongs - Beijing unique old city lanes. The neighborhoods of narrow, twisting streets represent the “real life” of Beijing, where passageways connect to courtyards of traditional compact homes. Pedicab tours of the hutongs cover the attractions that normally include the Drum Tower, courtyard neighborhoods and Prince Gong's mansion. There are lots of many small resturants, bars, and inns. From the top of the Bell Tower you can overlook the surrounding hutongs. 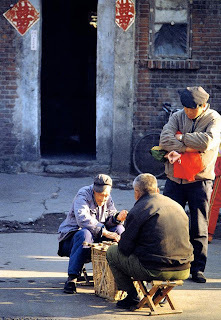 The most interesting part of the hutong tour is walking through "Pipe Tobacco Alley" near the Bell Tower. 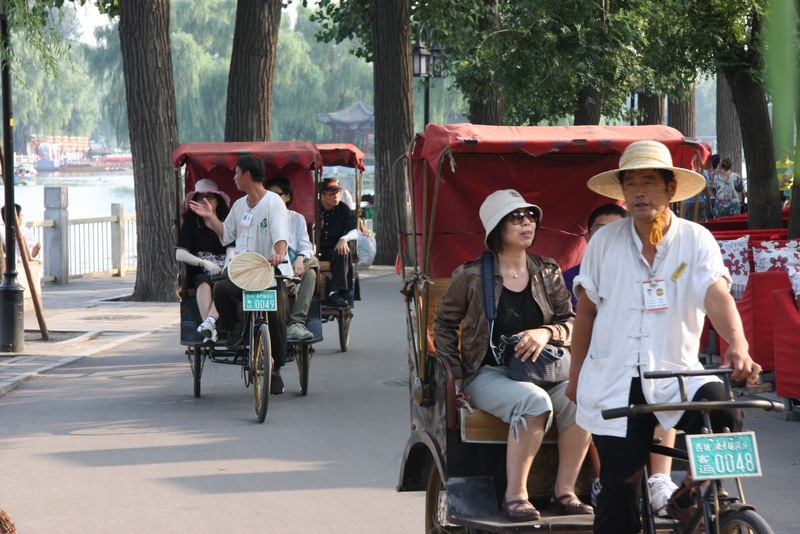 On this tour you will enjoy the real people's Beijing. 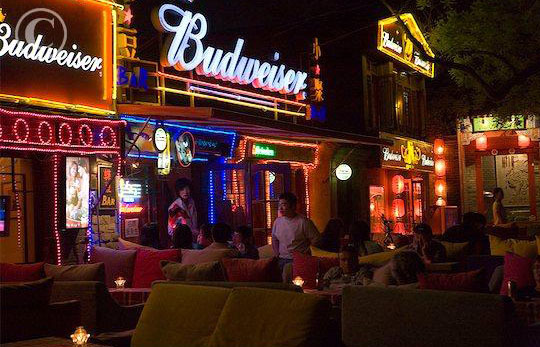 On the other end of Pipe Tobacco Alley has some of Beijing's fashionable cafes. And the Hutongs are disappearing. On my first trip there (meaning Dane' Dad) in 2000, there were over 30k and now progress and unimaginable development has reduced that number to under 3,000. 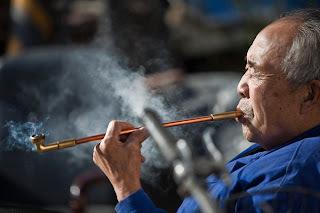 Old Peking is vanishing rapidly. As the largest royal garden in China, Beijing's Summer Palace is actually a parklike imperial retreat spread out over 10 square miles. The Summer Palace in northwest suburban Beijing is the largest and most complete imperial garden existing in China. 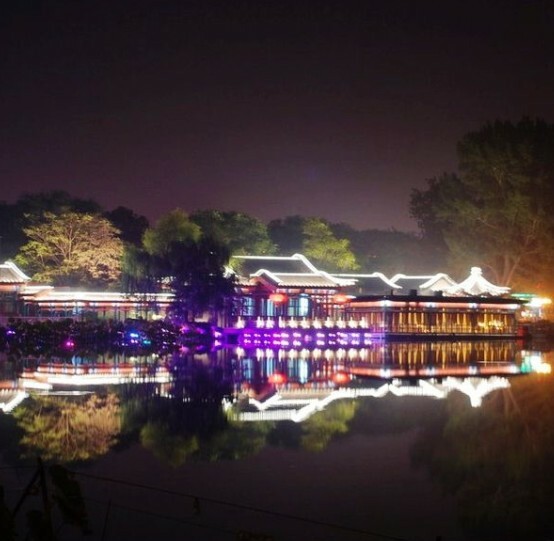 Once a summer retreat for emperors, this 290-acre park is still a retreat for the tourists, who can relax here or walk around ancient pavilions, mansions, temples, bridges and huge lake. Summer Palace mainly consists of Longevity Hill (Washoushan) and Kunming Lake. Much of it is covered by Kunming Lake. With masterly design and artistic architecture and integrationg the essence of Chinese garden arts, the Summer Palace has a title of "Imperial Garden Museum". It is an imperial garden most completely reseved with richest landscapes and concentrated buildings. The Summer Palace was added to the world cultural heritage list. If you go to the Temple of Heaven in the early morning, you can see groups of people practicing all types of kung fu and taiji. Many people contentedly entertain each other with music,songs or quietly playing cards. 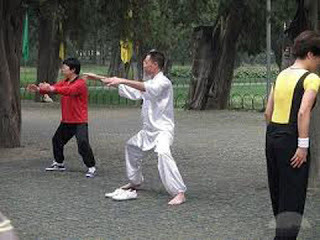 You can also practice with them if you are so inclined. Another good activity for the jetlagged is drawing caligraphy with water. What makes the temple unique is the century-old trees - line upon line of Chinese cypress, Chinese juniper and scholar trees. Some of the cypresses are more than 600 years old. Visitors from Dr. Henry Kissinger to Dane Hodges have been impressed with the endless gardens...oh wait, Dane skipped this site to take a little rest with Mom, so Josh took the pictures here! What is the symbol of Beijing? There are various answers. But Tiananmen Square is definitely on the top list. Located in the heart of Beijing City, it is the site for massive parades and rallies, which is the largest square of this kind in the world. This was the site when in 1949, from a rostrum on Tiananmen (the Gate of Heavenly Peace), Chairman Mao proclaimed the establishment of the People's Republic of China. Tiananmen Square is surrounded by Tiananmen ( Gate of Heaven Peace ) on its north ; the Great Hall of the People on its west, the meeting place of national people's congress of the People's Republic of China; on the east of Tiananmen Square is the National Museum of China, and visiting the exhibition is like reading concise China General History; there are Monument to the People's Heroes and Chairman Mao's Mausoleum on the south. 8. Wangfujing Market...spiders or snakes sir? 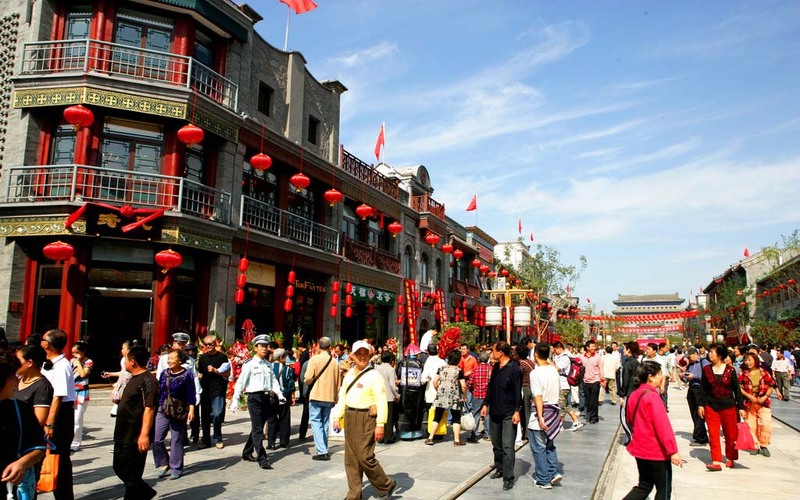 Wangfujing Street is one of the largest and most popular pedestrian streets in China with two large shopping malls - one each at the two ends of a pedestrian street where often hosts exhibitions and shows. 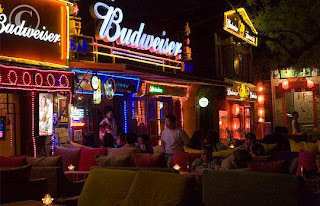 There are many outdoor cafes in the summer - a nice place to take an ice-cream or frozen beer under a shady umbrella. 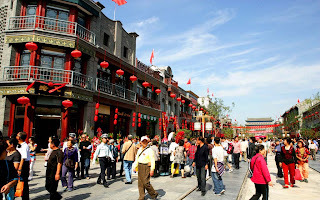 Wangfujing is now considered as the central heart of the city and it is really a long street. 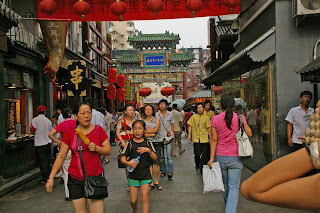 It is also home to a number of large department stores, souvenir stores, food stalls, and Chinese painting stores. If you spend 3 minutes in every chain store, it will take several days to visit them all. 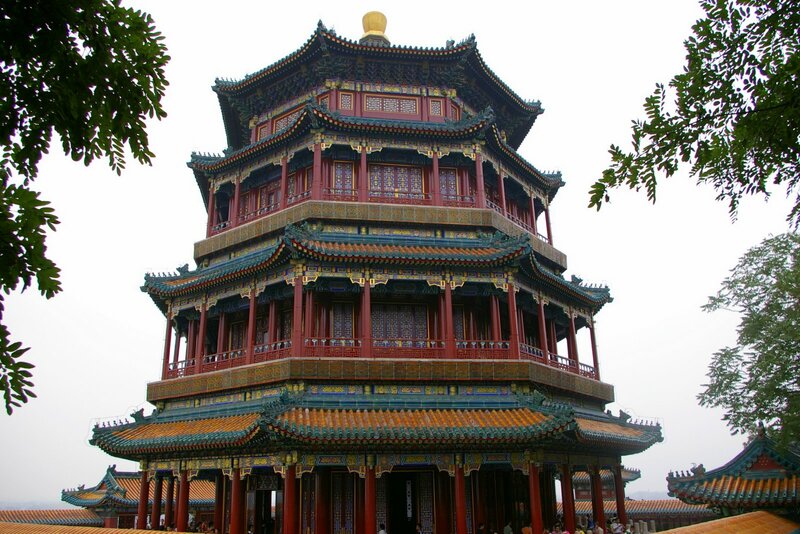 The Drum Tower was built in1272 during the reign of Kublai Khan, at which time it stood at eh very heart of the Yuan capital Dadu. 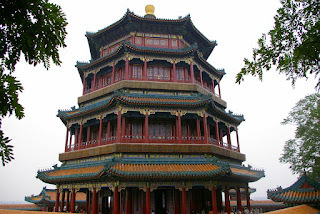 At that time it was known as the Tower of Orderly Administration (Qizhenglou). In 1420, under the Ming Emperor Yongle, the building was reconstructed to the east of the original site and in 1800 under the Qing Emperor Jiaqing, large-scale renovations were carried out. 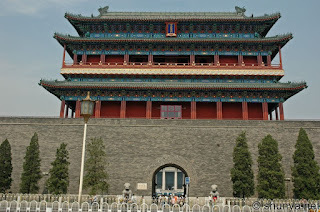 In 1924, the name of the building was changed to the Tower of Realizing Shamefulness (Mingchilou) and objects related to the Eight-Power Allied Forces' invasion of Beijing and later the May 30th Massacre of 1925 were put on display. Nowadays, the upper story of the building serves as the People's Cultural Hall of the East City District. The Bell Tower originally housed a huge iron bell. But because its tolling was not loud enough, this was replaced by a massive cast bronze bell over 10 inches thick that is in perfect condition today. The iron bell was moved to the back of the DrumTower where it has remained for over 500 years. As recently as 1924, the bronze bell could be heard ringing out the 7:00 p.m. chime from a distance of over 20 kilometers. According to legend, an official named Deng tried unsuccessfully for over a year to cast the bell. On the eve of the final casting, hisdaughter, fearing that further delays and loss of working time would bring blame on her father, decided to sacrifice her life in order to move the gods to bring about a perfect casting, and threw herself into the molten bronze. Her panic-stricken father could only recover a single embroidered slipper from the flames. The casting was a success and the emperor, moved by the young girl's spirit of sacrifice, named her the "Goddess of the Golden Furnace" and built a temple in her honor near the foundry. By the ordinary people she was remembered as the "Goddess Who Cast the Bell." The Panda House is located in Beijing Zoo. Now the Beijing Zoo covers an area of about 50 hectares. The animal houses and enclosures, with a total floor space of 40,000 square metres, include those for pandas, elephants, brown and polar bears, tigers, hippopotami, rhinoceros, antelopes, giraffes and reptiles. And honorable mention is the lake near Forbidden City, airport, Lama Palace, West Train Station, Silk Market, Bar Street, needle and Olympic Stadium, which we just drove by several times. Mongolian army sent its military forces into Central Asia and Europe. In 1276, not long after the founding of the Yuan Dynasty, Kublai Khan led his army, capturing the capital of the Southern Song Dynasty (1127 - 1279) and thus he unified the entire China. At that time, the territory of the Yuan Dynasty stretched to Mongolia and Siberia in the north, the South Sea in the south, Yunnan Province and Tibet in the southwest, eastern part of Xinjiang Province in the northwest and the Stanovoi Range in the northeast. The total area of the country was over 4.6 million square miles. drama, along with the Tang poem and 'ci' poem of the Song Dynasty (960 - 1279), was considered another heritage of Chinese literature. During the glorious period of the Yuan Dynasty, diplomatic activities with foreign countries were quite frequent with many foreign envoys, merchants and travelers traversing the sea to come to China. Among them, the famous Italian merchant Marco Polo was a successful cultural transmitter who wrote the historic travel notes, The Travels of Marco Polo, informing the West about China. In the late Yuan Dynasty, the internal contradictions of the ruling class, serious natural disasters, and unreasonable grading system together aroused the indignation of the people. In 1367, the rebel army led by Zhu Yuanzhang captured the Yuan capital, ending the ever mighty Yuan Dynasty. Two brothers, Niccolo and Matteo Polo, are Venetian merchants with interests in Constantinople and in Sudak, a Venetian colony on the coast of the Crimea. In 1261 they travel through the Black Sea to Sudak and then continue on to the Volga, where they visit Sarai Berke, the capital city of the Golden Horde. They stay among the Mongols for a year, but then find their route home blocked. Berke, the Muslim leader of the Golden Horde, is at war with his cousin Hulagu, the pagan ruler of Persia. The Polo brothers are advised that their wisest course is to continue eastwards to other Mongol centres along the old Silk Road. They travel on to Bukhara, where they stay for two or three years. In Bukhara they are eventually persuaded to move yet further east, to the greatest centre of Mongol power - the court of Kublai, the great khan, in China. Here the brothers are once again welcomed, and once again are enticed or coerced into spending a few years (it is impossible to leave a Mongol court without the khan's permission). At last Kublai Khan sends them home, with letters to deliver to the pope. They reach Venice in 1269. Niccolo's son Marco, only seven when he had last seen him, is now 15. Two years later the brothers set off again (they have promised Kublai Khan that they will return, with precious commodities from the west). They take young Marco with them. This time the journey east takes four years. The little party travels by sea from Venice to Syria, then rides or walks the rest of the journey - to Tabriz and by a southerly route, through Yazd and Kerman, before joining the Silk Road to the north of the Hindu Kush. Eventually, after skirting the Gobi desert, they reach Kublai Khan's summer palace - the stately pleasure dome which he has built north of the Great Wall at Shang Tu, transliterated by Marco Polo into Italian as Ciandu and now widely known as Xanadu. The Polo brothers receive a warm welcome from Kublai. They present to him young Marco - an encounter which, according to Marco, inspires immediate Mutual admiration. Certainly Marco is offered employment. Marco spends seventeen years in China, fulfilling a wide variety of tasks in Kublai Khan's administration. 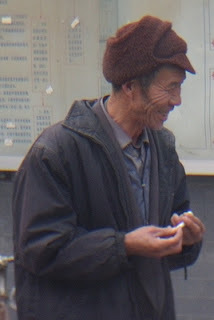 He is in effect a member of an occupying force, speaking Mongolian but not Chinese, so his understanding of the people is limited. But he travels a great deal, often trading on his own account as well as serving the emperor, and he describes many cities. Hangzhou is his favorite. He pretends not to be certain which is more impressive - the number of its bridges or the number of its prostitutes. His interests seem more with the latter. Those who sample these women, he says (as if speaking of someone else), 'are so much taken with their sweetness and charms that they can never forget them'. Marco has often been criticized for failing to mention one peculiarity of China - the drinking of tea, which is already by this time a Chinese addiction. The two oddities which strike him most forcibly are a marvelous black stone, useless for building with, which the Chinese dig up and burn (one of the earliest references to coal); and their use of bank notes. Paper money is not a Mongol innovation, being in use already in the Song dynasty, but Marco gives a fascinating description of government officials stamping the notes with a cinnabar seal. Marco and his family prosper in the service of Kublai Khan, but eventually they become eager to leave. The khan is old. Chaos may follow his death, and they will be without a protector. Often they ask permission to go home. Always they are praised for their great contribution and told to stay - until luckily, in 1292, it suits Kublai to send them west. A young Mongol bride is to be sent to Kublai's great-nephew, the Il-khan ruling Persia. The land route is at this particular moment blocked, by warfare between Mongol factions. A sea journey is considered safer. The Polo family, experienced travellers, may help to bring the bride to her destination. The great khan orders junks to be fitted out for the expedition. He gives the Italians messages of goodwill to be delivered to the pope and the kings of Spain, France and England. The party makes its way down through the China Sea, through the Straits of Malacca and up the west coast of India to the Persian Gulf. When they reach Tabriz, they find that Kublai's great-nephew has died. So the bride marries his great-great-nephew, the new Il-Khan, instead. After spending nine months with the court at Tabriz, the three Italians finally set off home. They reach Venice in 1295. Marco, now in his forties, has been away twenty-five years. Marco had no intention of writing a book. Luckily for us he finds himself a prisoner in Genoa in 1298 (he has been in command of a Venetian galley in a war against the Genoese). A fellow captive is an author of romances, by the name of Rustichello. During a winter of enforced idleness, Marco tells him the story of his adventures. Rustichello writes it down. The Book of Marco Polo, wherein is recounted the Wonders of the World becomes so popular that numerous manuscript copies of it are made in several languages. Marco's contemporaries see his book primarily as what its title says - a book of wonders, rather than a factual account - and Rustichello's trade as a writer of romances has caused some more recently to question how much of the book is true, or whether Marco even made the journey to China. But Chinese sources confirm many details which were unknown in the west in Marco's time. The most he can probably be accused of, in providing one of the world's greatest travel books, are two familiar failings - a selective memory and a story-teller's tendency to exaggerate. There is, however, no truth in the tradition that he brought back the secrets of gunpowder, the compass, printing or noodles.